Big Battlefield Super Smash Bros. Final Destination  Super Smash Bros. 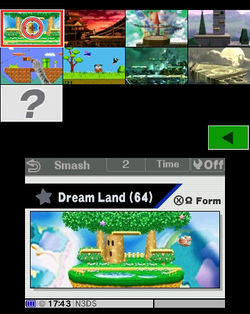 Final Destination Super Smash Bros.
↑ 11.0 11.1 11.2 11.3 Appears as part of Flat Zone X. There are 103 versus stages in Super Smash Bros. Ultimate, with five more planned to be future downloadable content. 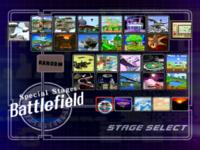 7 stages are unique to Ultimate while the other 96 comprise nearly every stage from previous Smash games: 7 from Super Smash Bros., 19 from Super Smash Bros. Melee, 26 from Super Smash Bros. Brawl, and 44 from Super Smash Bros. 4 (18 from the 3DS version, 18 from the Wii U version, and 8 that are in both versions). Ω forms return for each stage, along with a new Battlefield form for every stage. 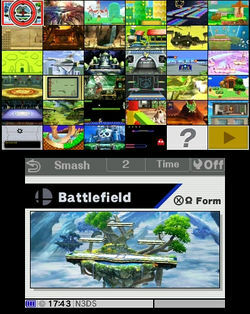 All Battlefield and Ω forms have the same size and terrain as Battlefield and Final Destination, respectively. Up to 8 players are supported on every stage. 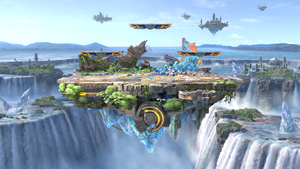 Not counting either single-player only stages or previous versions of Battlefield and Final Destination, there are only 15 stages that do not return in Smash Bros Ultimate; 2 from SSB64 (Planet Zebes and Sector Z), 4 from Melee (Icicle Mountain, Mute City, Mushroom Kingdom and Poké Floats), 2 from Brawl (Rumble Falls and PictoChat), 2 from Smash for 3DS (Rainbow Road and Pac-Maze), and 5 from Smash for Wii U (Miiverse, Woolly World, Orbital Gate Assault, Jungle Hijinxs and Pyrosphere). This page was last edited on April 20, 2019, at 02:49.